Great Cheat Table for Final Fantasy Tactics - The War of the Lions! / Great Cheat Table for Final Fantasy Tactics - The War of the Lions! I've played Final Fantasy Tactics for a Decade, but only just recently I noticed that there are fewer codes (CWCodes) for the PSP version of Final Fantasy Tactics (The War of the Lions), so I decided to create a cheat table for cheat engine that can help you guys do almost anything with the parameters of your characters in your Party Roster. This cheat table only contains addresses for units in Party Roster, and can't really change anything in battle - I can create another one for this. There is a list on Table Extras with substitution values for any items, classes, and everything related to units in your Party Roster. Unfortunately I didn't create any CWCodes, because I'm feeling lazy - but hey, I'm doing it for free so stfu. You'll need to configure your Cheat Engine properly to use this cheat table. 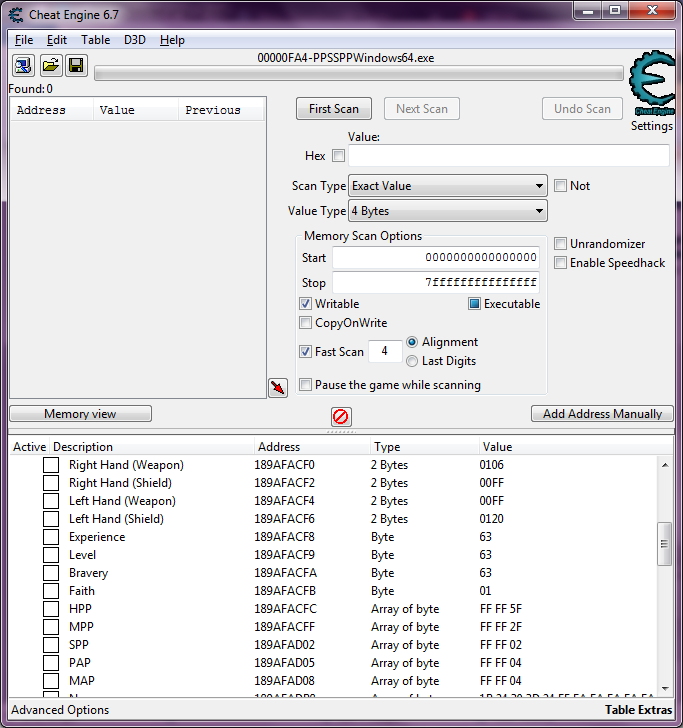 Make sure MEM_PRIVATE, MEM_IMAGE and MEM_MAPPED are enabled on Cheat Engine scan settings. 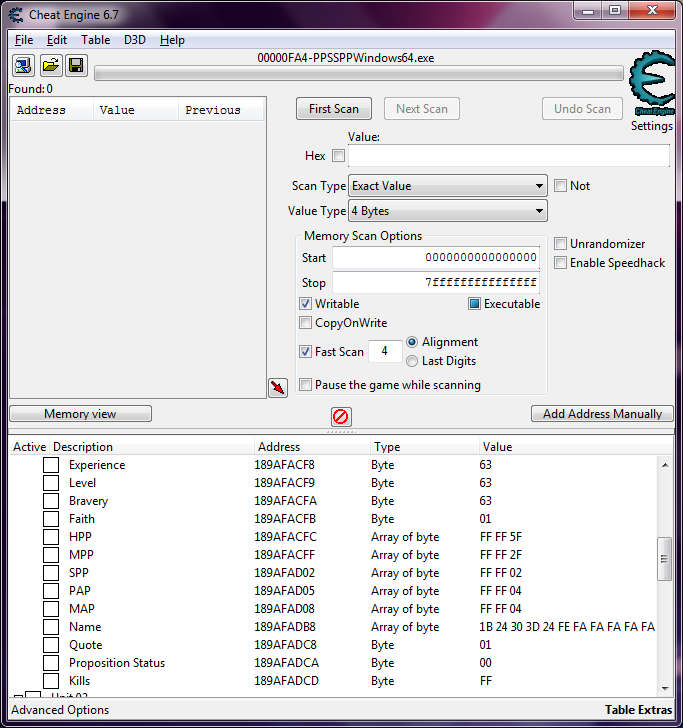 When you load the cheat table on Cheat Engine, you'll probably need to recalculate the addresses by offset. I recommend you to map an address related to a character level, and then compare it to the one in my cheat table, then add\subtract the difference between these two addresses for all addresses. To easily recalculate the addresses for all in the list, select all and then right click, then click on "Recalculate New Addresses". Input a minus before the number you calculated to subtract from them - if needed. The table has addresses for all 24 playable characters and 3 guests, so 27 units in total. NOTE: a Character can have multiple finishers (FE) in its name, but only the letters before the first one will appear. For example, Ramza's name is 1B 24 30 3D 24 FE FA FA FA FA FA FA FA FA FE , but only the letters before the first FE will be accounted. 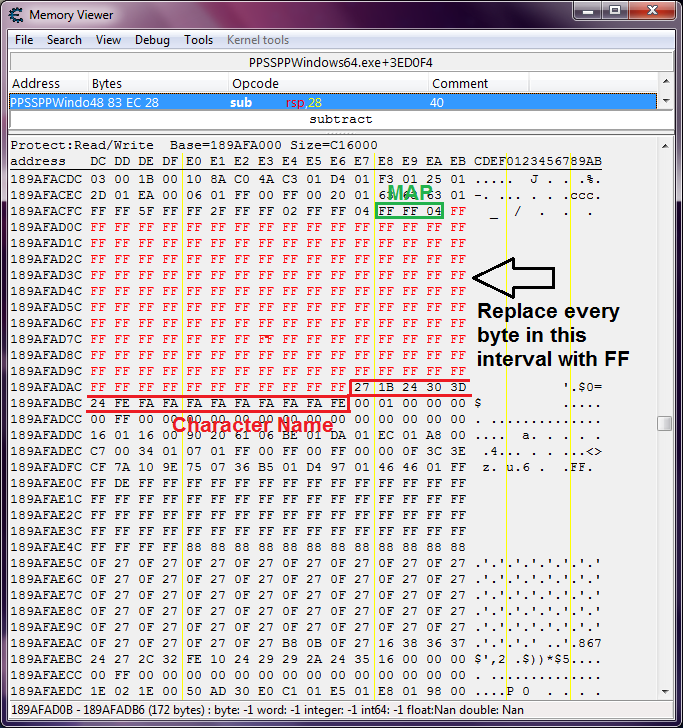 Some other units have non-FA bytes after the first FE, but it matters not, and those can be replaced by anything without any effect. Edit2: Genders are: 00 or 10 ("neutral" - this adds a Bard or a Dancer in the job wheel, regardless of the previous gender) 20 or 30 (Monster) 40 or 50 (Female) 60 or 70 (not sure) and 80 or 90 (Male). Edit3: If you're having trouble finding the correct addresses on your own in order to calculate the difference, you can ask for help right here! I'll gladly help anyone in trouble. For all 27 possible characters you can edit their Sprite, Roster NUmber (don't change it, coz it makes everything buggy), current job, gender, sign, secondary command, reaction (like counter), support (like Equip Katana), Movement ability (Move +3, Fly, for example), all equipments in all available slots (this is useful, for example, if you want to equip something that normally cannot be equipped in a certain class, like a Gun in a Black Mage), Experience, Level, Bravery, Faith, Physical Attack Points [PAP], MAP, SPP, HPP and MPP, their names, quotes displayed when you press select on their names, proposition statuses, and kills (this last one is useful if you want a Dark Knight, which requires at least 20 kills). For better results, only edit these addresses while on World Map Screen. The game uses several addresses in memory as reference. This means that if you edit those while formation screen is opened, they will go back to their original values as soon as you close it, so heed my words! RE: Great Cheat Table for Final Fantasy Tactics - The War of the Lions! Oh... Cheat Engine, I love this!